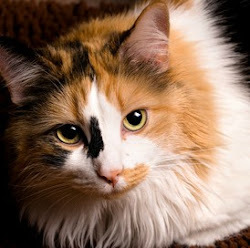 Thomasina's Purrls Of Wisdom About Cats: Why Do Cats Pull Food Out Of Their Bowls? Why do cats pull food out of their bowls and eat it off the floor? My cats make such a mess! Yikes!! I'm sorry about the mess. 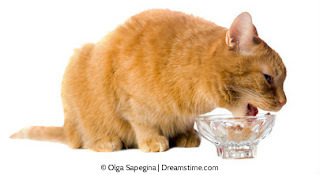 Although I don't do it, I can think of a few reasons why cats pull food out of their bowls. When you think about it from the cats' point of view, pulling food out of their bowls probably makes perfect sense. Outside, Mother Nature wouldn't put the mice they just caught in bowls. They'd eat the mice off the ground. So they're just doing what comes naturally. But instead of the ground, they're using the floor. Also, instinct tells us to take our food someplace safe to eat. And some of us like to eat in private, with no other cats around. Eating out of little bowls all lined up in a neat row isn't exactly private and may not feel safe if the cats don't especially like each other. My safe, private dining room is a little table in a big closet. The door is always open, and I love it in there! Take a look at your cats' dishes, too. Our whiskers are very sensitive, and if they touch the sides of our food bowls, they tingle. That's really uncomfortable and very annoying. We used to have plates with raised edges so our whiskers didn't touch anything, and our food didn't get stuck along the sides of a bowl where we couldn't get to it. We have Beco bowls like the one in the picture now, and we love the rough surface. It's almost as good as eating off the ground outside. Whatever you get, make sure the bowls have very low sides and are wide enough to be whisker-friendly. And if you have a few cats, put their bowls several inches apart. We like some elbow room when we eat, just like you do. Speaking of bowls, I hear ours coming out of the dishwasher, so I have to get on my way. Hope this helps! Labels: Cat Behavior, Why Do Cats Pull Food Out Of Their Bowls?